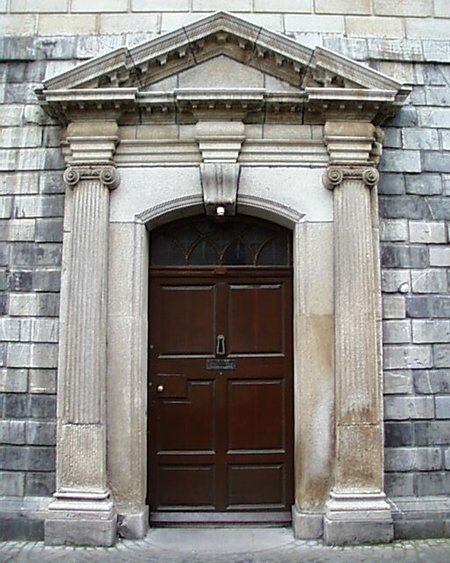 The old Library of Trinity College (old because of a newer neighbour built by Ahrends Burton Koralak) is Thomas Burgh’s masterpiece. A huge building, it originally towered over the university and city after its completion. 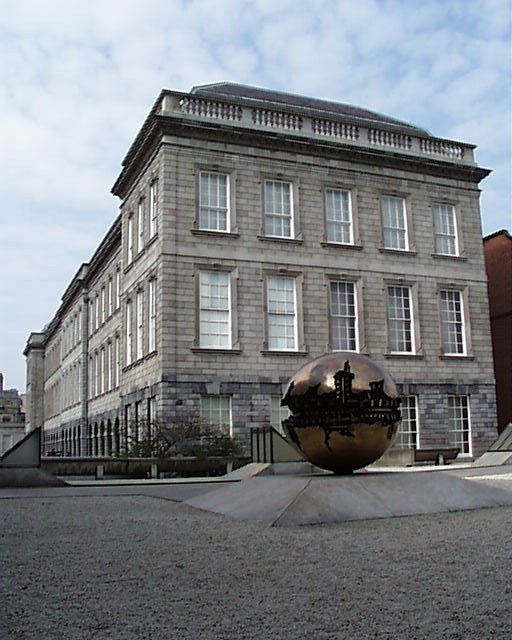 Even today, surrounded by similarly scaled buildings, it is imposing and dominates the view of the university from Nassau Street. The building has undergone two major adaptions. 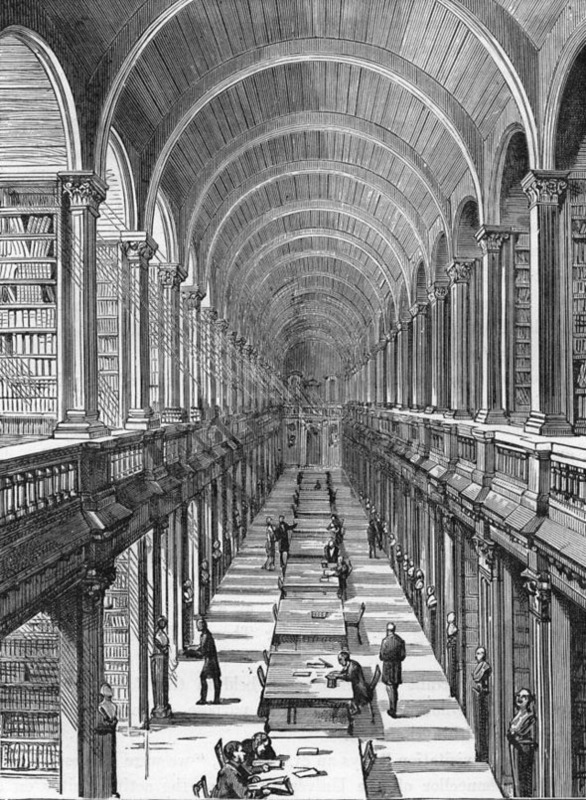 Originally the Library was placed on an open ground floor arcade whose purpose was to insulate the books from damp. This was filled in during the 19th century for more shelf space. The timber tunnel vaults that cap the library are not original, being added by Deane & Woodward in 1858-60. Originally the library had a high flat ceiling. Deane & Woodward were also responsible for the mansard roof. 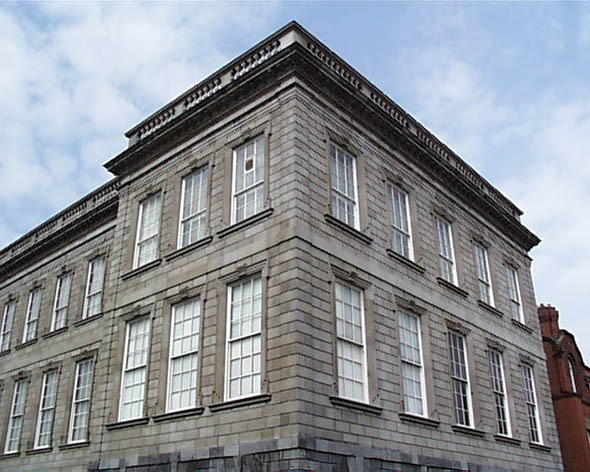 Described by Lewis in his 1837 book, A Topographical Dictionary of Ireland: “The fourth side is formed by the library, a very fine building of granite, the basement story of which forms a piazza extending the whole length of the square, above which are two stories surmounted by an enriched entablature and crowned with a balustrade. 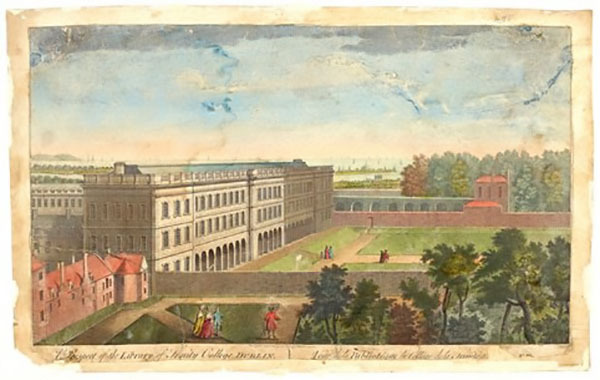 It consists of a centre and two pavilions at the extremities: in the western pavilion are the grand staircase, the Law school, and the librarian’s apartment; from the landing-place large folding doors open into the library, a magnificent gallery, 210 feet in length, 41 feet in breadth, and 40 feet high; between the windows on both sides are partitions of oak projecting at right angles from the side walls, and forming recesses in which the books are arranged; the partitions terminate in fluted Corinthian columns of carved oak, supporting a broad cornice, surmounted by a balustrade of oak richly carved, and forming a handsome front to a gallery which is continued round the whole of the room.